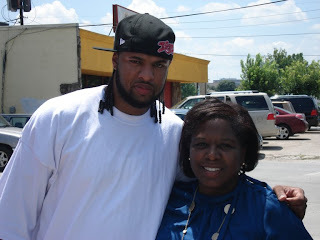 Isiah Factor | The Insite » MARY BENTON IS KEEPING IT REAL WITH SLIM THUG! MARY BENTON IS KEEPING IT REAL WITH SLIM THUG! August 28, 2008 | Posted in Uncategorized | Comments Off on MARY BENTON IS KEEPING IT REAL WITH SLIM THUG! THE INSITE PICTURE OF THE MONTH! By: Mary Benton – I was on my way to interview Breakfast Klub owner Marcus Davis, on a story about Senator Barack Obama, when I saw Houston Rapper Slim Thug walking out of the restaurant. He’s an intimidating 6’6” and was very friendly and receptive to me – his fan. Of course Slim Thug knows who you are, I was surprised and flattered when he said that he recognized me from TV. This proves you are never to young to watch the news, or too old to know who the Boss is, and never too cynical to realize that life is made up of little moments that leave big impressions.